The Louisville Bats, in partnership with Four Roses Bourbon, announced in a press conference at Louisville Slugger Field on Thursday morning that the team will re-brand as the Derby City Mint Juleps for two games during the 2019 season. The team will wear special Mint Juleps caps and jerseys on two home dates: Saturday, April 13 at 2:00 against the Gwinnett Stripers (Thunder at Slugger Day), as well as Saturday, April 27 at 6:30 against the Norfolk Tides. The Mint Juleps kick off the celebration of Derby Season on Thunder at Slugger Day with Mint Juleps for sale, coming in commemorative logoed Derby City Mint Julep 15 oz. cups, on both April 13 and 27. On April 27, Four Roses will offer $3 Bourbon flights featuring four of their Bourbons, including Four Roses Bourbon, Four Roses Small Batch, Four Roses Single Barrel, and Four Roses Small Batch Select, the latter of which makes its debut in April 2019, the first new release in their permanent collection of Bourbons in 12 years. There will also be a Derby at the Diamond vintage glass giveaway to the first 2,000 fans on April 27. Derby City Mint Juleps merchandise, including caps, t-shirts, and more are available for purchase on the Mint Juleps' microsite, www.derbycitymintjuleps.com. 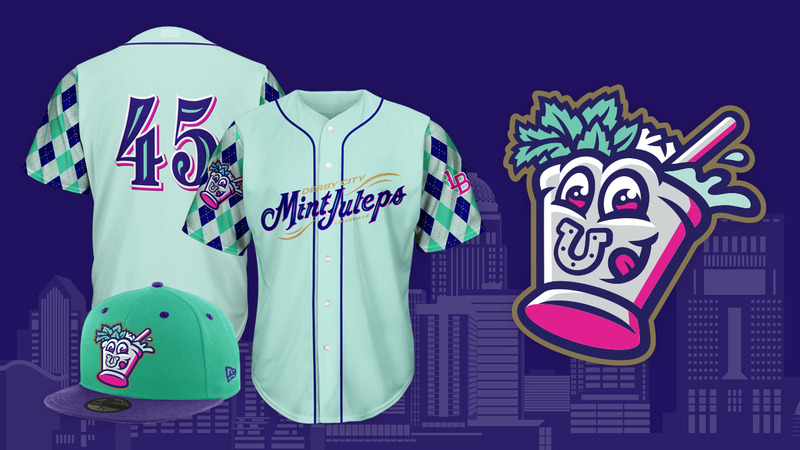 The Mint Juleps uniform, which was unveiled by the Bats and Four Roses at today's press conference, features a vibrant, fun, and friendly logo-a perfect representation of Louisvillians during Derby season. The nickname "Derby City" is widely used to describe Louisville, making it the perfect pairing with Mint Juleps, Louisville's specialty Bourbon drink. The Juleps' color scheme celebrates the festivities that have taken place every May in Louisville since 1875. Two shades of mint are complemented with hot pink and purple and rounded out with gold accents and a silver julep cup. Argyle sleeves on the jersey pay homage to jockey silks-a stand-out visual of horse racing. From head to toe, everything comes together with a two-toned mint and purple cap featuring the Mint Julep mascot. The jerseys will be auctioned off May 1-15 to benefit the Permanently Disabled Jockeys Fund. For more information, visit www.derbycitymintjuleps.com and follow the Bats for up-to-date information regarding the Derby City Mint Juleps across our social media platforms.